AV08. 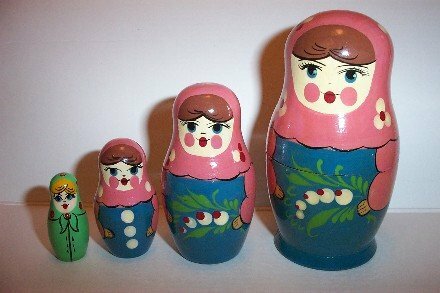 Altai Kraj - Pink & Blue Doll 4n 4.5"
Very unusual color of nesting dolls – the three largest dolls are painted in dusty pink and dusty blue tones, and the smallest doll is a baby wearing green. This set appears to be painted in the Zagorsk / Sergiev Posad style, but does not appear to be from that region when compared to those sets. The dolls have very nice faces and bushy brown hair. The fit on this set is very tight, but they are in good condition. According to a paper inside of a similar dolls, these come from the town of Barnaul in the southern Altai Kraj region bordering Kazakhstan.